No other technological advancement has had such far-reaching impact-professionally, politically, personally, and socially-as the ability to "go online." In recent years, such phrases as, "I'll send you an email," "Visit my home page," and "I hate this computer," have been uttered by millions of citizens of cyberspace, now known as Netizens. Terms once disdainfully characterized as geekspeak have found their way into our senior society's vocabulary. For better or worse, the Internet has become as omnipresent and ubiquitous as pretentious writers using big words stolen from Reader's Digest "It Pays to Improve Your Word Power." Whether you're sending email from home or while traveling, reading a computer user newsletter to stay current with the technology, downloading software updates, or transmitting photographs of your grandchildren to a friend or family member anywhere in the world, the ability to communicate electronically is now an integral part of our global boomers and seniors communities today. Communicating online is also a natural extension of all the communication skills learned throughout our lives. Most of us don't have time to engage in telephone tag or to wade through layers of voicemail menus only to be placed on hold -- not that listening to 27 minutes of The Captain and Tennille's "Muskrat Love" is so terrible. Using email and the Internet to obtain technical support, pay bills online, invest, read a computer user newsletter to learn new tricks and skills, shop for just about anything, and even renew automobile and voter registrations are a reality, thanks to the Internet. And we haven't even scratched the surface! Communicating online is the most consistently productive form of communication available to us. Members of every segment of society and from every demographic group are flocking to the Internet in record numbers and none more so than members of our 50+ generation. 47% of Americans 65 and older use the Internet. The number of seniors online jumped by 67% between 2000 and 2004. More than 50 million U.S. adults over the age of 50 have Internet access, and this number is growing rapidly, according to a recent study conducted by SeniorNet and Charles Schwab, Inc.
As "Mr. Modem," the thousands of questions I receive each year requesting computer help for senior citizens has increased significantly. My weekly computer user newsletter demonstrates that seniors have an above-average interest in Web sites that deal with politics, government, investing, news, travel, religion, medicine, and culture, and are looking to increase their computer knowledge. For today's active and interactive boomers and seniors, learning how to use a computer and accessing the Internet is no longer the daunting challenge it presented only a few short years ago. In fact, asking for computer help for senior citizens and boomers, and learning to use a computer can be a lot of fun and the benefits are most significant. Many seniors whose initial reaction to computer use was, "I can never do that," are excited and proud of the new skills they learned or the old ones they resurrected just by asking for some computer help. For senior citizens, many become proficient enough to offer their services to community organizations performing data input or other basic computer tasks, taking part-time jobs or volunteering to teach computing and the Internet to other "new" arrivals to the cyberscene. By asking for computer help for senior citizens and learning how to use technologies to their advantage, computer and Internet usage has been shown to ease depression and loneliness, and remove the sense of isolation many older individuals feel, particularly when the topic of computing or the Internet arises in conversations. Many older individuals find email an easier way to communicate than the telephone, an especially important consideration for people with hearing difficulties. Email also provides an opportunity to reconnect with old friends and distant family, and for grandparents to stay in contact and remain part of their grandchildren's lives, no matter how far away they may reside -- and all without incurring long-distance charges. Information - Using the computer to explore favorite hobbies and passions, research medical information and read product reviews prior to making purchases. Communication - Keeping in touch with friends and family through email, resolving billing issues with retailers, locating old classmates, or requesting information from a business or other organization. As a communications instrument, the Internet is unsurpassed for its ease, convenience, and cost effectiveness. Employment - Knowing how to use a computer can help seniors find a job. There are many sources on the Internet where individuals can learn about job requirements, job openings, and volunteer opportunities. Entertainment - Games, magazines, newspapers, Internet radio, movies, message boards and forums are all easily accessible online. Shopping - Shopping on the Internet is convenient, cost-effective, and safe, if you shop on reputable sites, with reputable retailers. The Internet allows you to compare prices quickly, without running from store to store, research particular items, read reviews and commentary before buying, and have purchases delivered to your door. When shopping online, just remember the old adage, "if it sounds too good to be true, it probably is." The message from the Internet is loud and clear: Welcome, Boomers and Seniors! If you enjoyed this article of computer help for senior citizens, and about baby boomers and seniors flocking to the Internet in record numbers, a lot more information, plus helpful computer- and Internet-related tips are waiting for you as a subscriber of Mr. Modem's Weekly Newsletter (www.MrModem.com)! 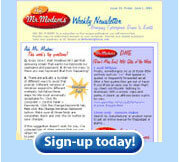 Subscribe today and Mr. Modem will personally assist you with computer help and will deliver useful computer tips, tricks, virus alerts, and hoax information each and every week in the "Ask Mr. Modem" computer help newsletter.